It does not matter how old we are, our love for water parks is here to stay. 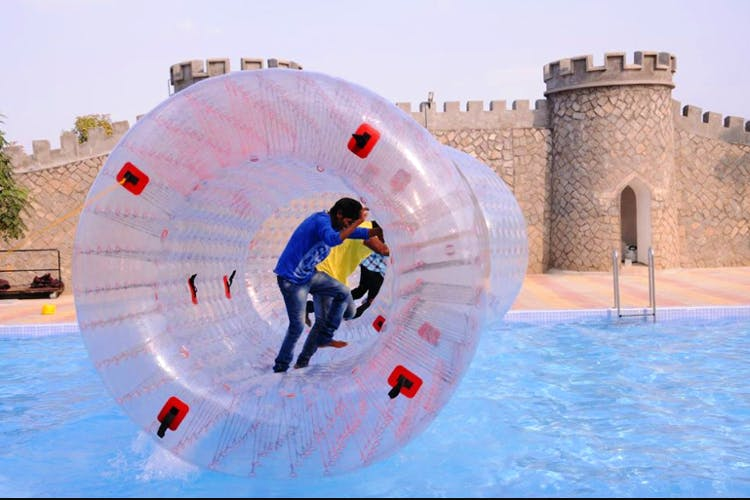 Escape the monotony of everyday life by hitting Escape Water Park in Shamshabad with friends or family. Thrill seekers, head to Escape Water Park and enjoy the multiple fun rides that include Family Board Slide (where 4 of you can slide down on a float board), Wave Slide, Free Fall, Multilane (where you can compete against your peers). If your kiddies wanna have some fun time of their own, then take them to the kids’ play pool where they can enjoy, while you relax. This park also has twister slides, an aqua bowl and rain dance too. After enjoying the slides, head to the food court to hog some delicious food, and beverages catering to every taste bud. A wide range of facilities are available at this park that includes lockers for baggage, a costume shop to purchase/rent swimming costumes and first aid kits too. Besides being a location for relaxation, it is also a sought-after venue for special group activities. Corporates pick this as an ideal spot for team building activities and games, outbound training activities, leadership programmes. You are not allowed to carry outside food, so you’d be happy to know that the food at the water park actually tastes good.